The European Court of Human Rights has awarded a Polish woman 25,000 euros ($33,000; £16,000) in damages after she was refused an abortion. Alicja Tysiac's eyesight worsened drastically after she had her third baby and she fears she may go blind. The 35-year-old mother was refused an abortion despite warnings that having a baby could make her go blind. In staunchly Catholic Poland, abortion is illegal unless the health of the mother or unborn child is at risk. The Strasbourg court ruled that the mother of three's human rights had been violated when she was denied an abortion on therapeutic grounds. When Alicja Tysiac became pregnant in February 2000, three eye specialists told her having another baby could put her eyesight at serious risk. But neither the specialists nor her GP would authorise an abortion. After giving birth later that year, Ms Tysiac suffered a retinal haemorrhage and feared she may go blind. 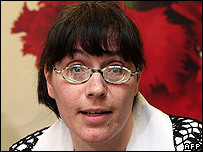 She now wears glasses with thick powerful lenses but she cannot see objects more than a metre and a half (5ft) away. As a disabled single mother, she struggles to raise her three children on her meagre state pension. The court ruling will not affect Poland's strict abortion laws, which some right-wing politicians want to make even stricter. But it does highlight the difficulties Polish women have of obtaining even a legal abortion. Polish women's rights groups estimate there are just 200 legal abortions performed every year.